You can have the best bow in the world, but the best bow is only as good as its bow strings. At 60X Custom Strings, we build high-performance custom bowstrings and cables. Our strings have the performance and durability to keep going when you’re out shooting. You know you’re getting the best with 60X--our strings have won over 100 world and 800 national championships. First, 60X Custom Strings guarantees the stability and consistency of our bow string as a result of our build process. Our custom bowstrings are built using a specialized process perfected through years of experience. We’ve learned what materials work best for each application and can custom make each order and tweak bow string specs as needed, yielding a huge performance benefit. Second, we use the best bow string materials available--not cheap substitutes. Third, we pre-stretch our bow string using several hundred pounds of tension. Our pre-stretch eliminates peep rotation and creep on your bow string. Instead of taking several hundred shots before your bow string is fully settled, after our process, your string will be settled in less than 10 shots. With all the stretch eliminated from the bow strings you will not have to keep retiming your bow or make adjustments. Our customers choose strings based on the make and model of their bow, their needs as a hunter or target shooter, and personal touches like color preference. At 60X, we build all our strings and cables to the highest material specifications. We prestretch our string using a proprietary process. And, if you order string fora specific model, it comes with the correct serving layout ready to go. Check out some of our best selling products to give you an idea of what your peers are buying! Curious about industry trends, the development of new materials, and what it means for archers? 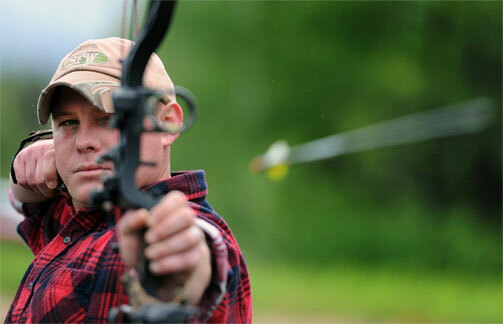 Check out the 60X Blog to learn more about the sport, the technology, and the archery lifestyle! Whether you’re buying a new bow or replacing the strings on an old one, 60X makes strong, long-lasting bow strings that won’t let you down. Strings and cables eventually wear out with use. Don’t let yours get to that point. Replace your strings regularly with us here at 60X, and shoot with confidence. Have any questions? Use our Online Chat at the bottom of the screen, or call us at (724) 525-3972.